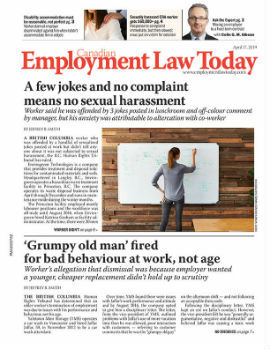 An Ontario employer must pay more than $25,000 for failing to properly handle an employee’s sexual harassment complaint, an arbitrator has ruled. The employee, who was referred as AB for privacy purposes, was an inspector for the Hamilton Street Railway (HSR), a public transit service in Hamilton, Ont., with 23 years of service. Her duties included communicating with transit operators in the field to ensure efficient operation of the service. AB was the only female inspector with the HSR. As the only female inspector, AB was concerned about proving herself and cracking what she believed was a tight-knit group of male inspectors. However, she soon faced difficulty. Not long after she became an inspector, AB was contacted by a supervisor to ask how things were going. The supervisor also asked what she was wearing, and when she replied “my uniform,” the supervisor asked her what she was wearing underneath it. AB hung up and the supervisor didn’t make any further inappropriate comments to her.